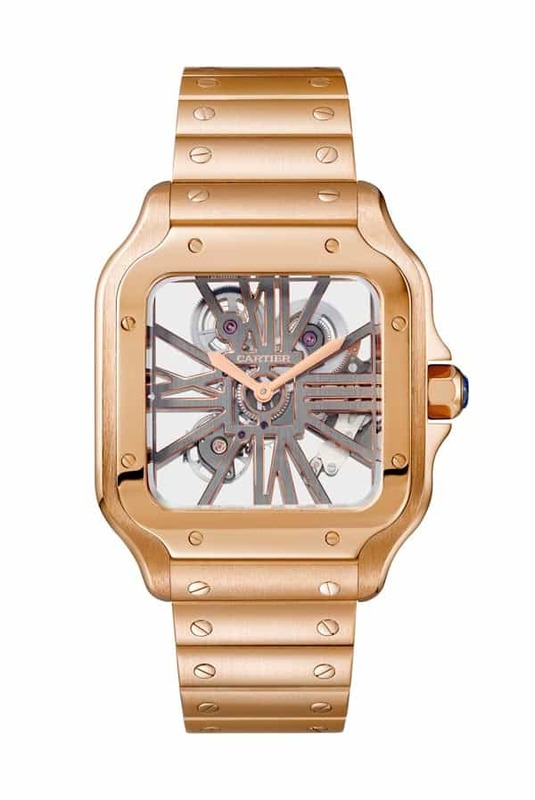 Skeleton X is the perfect showcase of new X-ray vision of watchmaking. It plays off the transparency of its powerful movement by intricately cutting away as much material as possible, without jeopardizing tolerances or shock resistance, to reveal the stunning beauty of the three-dimensional heart beating inside. The Skeleton X case, reshaped and very small, a mere 42mm, is perfectly on-trend: more angular, more masculine, less round. Its shape-within-shape-within-shape geometry – an X formed by four of the indexes is framed in a rectangle, in turn inside a circle – delights the eye. The new Santos-Dumont watch remains true to the elegance of the original 1904 model. Cased in gold, gold and steel or all steel, it features Roman numerals, visible screws, a beaded winding crown and blue cabochon, all elements which perpetuate the heritage of this major watchmaking classic. 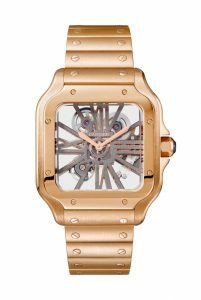 Its unchanged square shape – reminiscent of the geometry popular in Paris at the time – promotes pure and symmetrical design to mirror the four sharp corners of the Eiffel Tower. The bridges are coated with Super-LumiNova pigments which, while invisible during the daytime, reproduce and radiate the stored light once night falls. 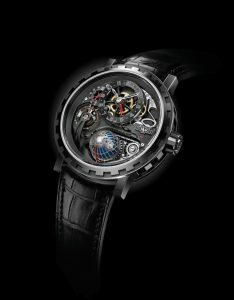 Jérôme de Witt has blended his passion for mechanics with the inspiration that has come from his travels – he decided to incorporate a textured globe into a watch. The iconic DeWitt chain has been crafted entirely by hand from 192 components. The chain causes the globe to rotate according to the time zone one is in, with a day/night indicator. 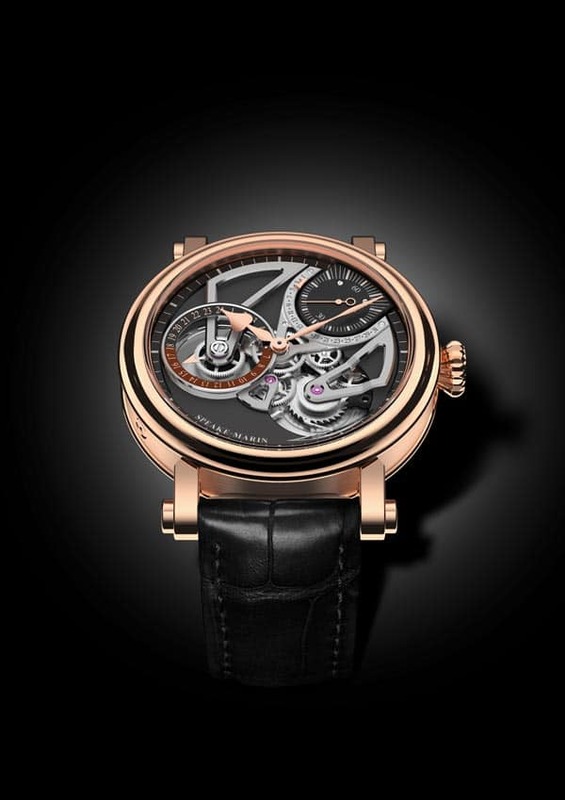 This timepiece features a mechanical movement with a 55-hour power reserve. The new movement featured in One&Two Openworked Dual Time is therefore the SMA02 Calibre: an Openworked movement, which integrates a Dual Time indication and a retrograde date. It keeps the visual balance between the barrel, the oscillating mass and the small seconds at 1:30. It creates a triangulation which plays with the ‘3’ figure, as it is the case on the other Openworked models. This new aesthetic is very modern and masculine thanks to its colour mix (brown, silver and black) and its sharp angles of the bridges.